South Africa. 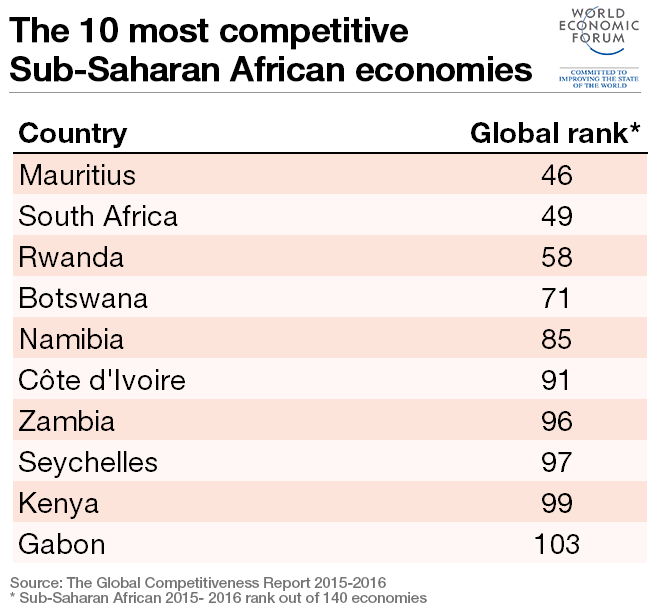 Moving in the opposite direction to Mauritius, South Africa climbs seven places to 49th. It has improved year-on-year in its uptake of ICTs and established itself as the region’s most innovative economy. South Africa also tops the region for the efficiency of its financial markets, a pillar on which it ranks 12th globally. It performs reasonably strongly on the pillars of infrastructure and institutions, although corruption and security remain concerns, but needs to make progress on health and education. Rwanda. Advancing four places for the second year in a row, Rwanda’s overall position of 58th reflects improvements in the financial development pillar – especially regulation of securities exchanges – and business sophistication. It scores 8th globally for labour market efficiency, thanks in part to the third-highest female labour participation rate in the world, and 17th globally for the strength of its public and private institutions. However, improvements are needed in some fundamental areas of competitiveness including infrastructure, health and higher education. How can Europe raise its competitiveness?